This is the original series of Spider-Man comic books. After issue #441, Marvel Comic books re-started the numbering at #1. The next 58 issues are listed at NewKadia as Amazing Spider-Man (1999 series). After #58, Marvel numbered the next issue #500 (441 + 58 = 499). These comic books are listed as Amazing Spider-Man (2003 series). Early issues are reprinted in Marvel Tales (1964 series). Issue #1 is reprinted in Marvel Milestone Edition. We have 185 of the 441 issues. First marriage proposal to Mary Jane. Since 2000, Amazing Spider-Man comics have been the best selling comic books at NewKadia.com. For customers who buy Amazing Spider-Man comic books, NewKadia is the place to shop. Although the Amazing Spider-Man series is the most popular, hundreds of other Amazing Spider-Man comic books are for sale here. They range from 2 issue mini-series to longer series, such as Spectacular Spider-Man. In each case, when you buy Amazing Spider-Man comic books at NewKadia, they come with our 100% money-back guaranted. So, if you want to buy Amazing Spider-Man comic books, our collection of thousands of issues is the largest collection available on one website. 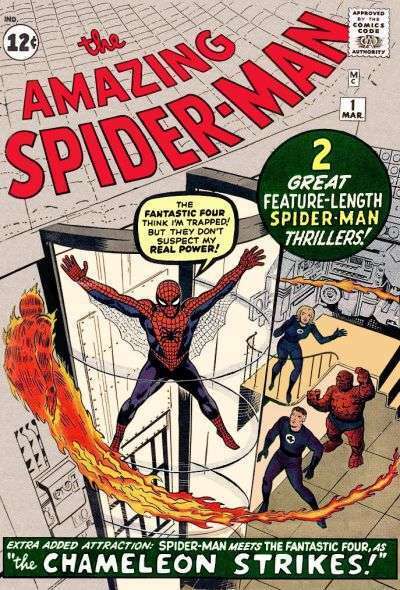 We've been tracking the biggest selling comics at NewKadia for 15 years -- 180 months, and incredible as it may seem, Amazing Spider-Man (1963 series) has been the best selling comic here for 178 of the 180 months. So, the natural question is: "Why?" Well, my friends, the answer is pretty easy. It's because the stories and plots of the original series are among the best ever written and drawn. Starting with the story of the high-school aged Peter Parker, boy-nerd, turning into a super-hero, the basic themes of the character have touched two generations of readers. The early issues, drawn by Steve Ditko, captured the skinny little Parker character just perfectly. This super-hero was so different, in so many ways, the creative blast was overwhelming to readers then, and remains strong even now. The movie "Spider-Man 2" captured Parker's angst nearly perfectly (and that's why Roger Ebert called it "the best super-hero movie ever filmed"). Even if you took the big action scenes out of the film, the remaining emotional story line -- Parker's inability to relate to girls -- perfectly captured the spirit of the comic book series and the reality of young adulthood. If you haven't jumped on board the bandwagon, you should. It is groundbreaking, and often imitated. Whenever a super-hero has had self doubts, or a befuddled state of mind, it's a rip off of this series. Strip away the super-hero theatrics and the series has great love stories (Peter and the ill-fated Gwen Stacy; Peter and Mary Jane), and the never-ending tale of Peter's blaming himself for his uncle's death. This original series ran for 441 issues, until they re-started the series in 1999 with issue #1. But, 58 issues later Marvel came back to its senses, and starting with issue #500 re-adopted the original numbering system. So there you have it. if there ever was an "Academy Award" or "Nobel Prize" for the best ongoing series of the past 50 years, this is the winner if the voters are the customers who have spoken with their wallets.